To make the path of employment wider the Karnataka government has launched a new scheme for the youth of the state on Monday. The new employment scheme namely Kaushalya Karnataka Scheme is dedicated to the young unemployed people of the state. Under this scheme the youths will be able to enhance their skill and knowledge to get jobs in future. What are the main features of the Kaushalya Karnataka Scheme? The scheme namely Kaushalya Karnataka Scheme is launched in Karnataka by the Chief Minister Siddharamaiah on Monday, 15th of May 2017. The scheme is for the job opportunity. Under the scheme youths of the state will be able to enhance their skill and knowledge about the real life. Through which the chances of getting jobs will be wider for the unemployed people. This scheme will be helpful to make them more skilled. The main aim of the scheme is to make entrepreneurs. It is not a conventional scheme that creates jobs for the youths. But it is a skill enhancing scheme that will help the people to become an entrepreneur and create own jobs. There will be two departments in this scheme. These departments will be called Vahini 1 and Vahini 2. The first one will be for the skill development and livelihood while the other one is for the creation of jobs. These two departments are governed by the state government of Karnataka. There were nearly 800 youth were present. Unfortunately because of the poor network and server not all of them could register. However many of them have already registered with the scheme through online process. There are many categories like illiterates and literates under the scheme. Youths will have to register according to their status and age group. Also they have to make provide proper information while filling up the form. Mobile app: There will be a mobile app for the scheme. Through this mobile app, people can easily register with the scheme. The Kaushalya Karnataka Scheme mobile app is available on Google Play Store on Android phones. To register via Android App of this scheme, the candidate needs to link their aadhaar card number with the app. Once the aadhaar card number is entered, candidates can easily register under the scheme. Stipend details – Before this scheme happened, the stipend was paid to the apprentices as Rs. 1000/- to Rs. 1500/-. Now the department has decided to make it salary basis. Now once the candidate is registered with the scheme, he / she will be able to take out monthly salary. 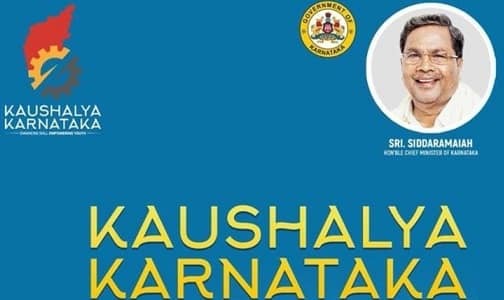 Who are eligible and beneficiary for the Kaushalya Karnataka Scheme? Eligibility: The scheme is launched for the young people who are aged from 18 to 35. Young people who are dropped out from school or colleges and could not finish their studies are eligible for this scheme. Only unemployed people are eligible. Beneficiary: According to the state, nearly 5 Lac jobs will be created. 25% of the total 5 Lac posts will be reserved for the scheduled caste, 7% of the total jobs will be reserved for the Scheduled tribes, 3% of the total jobs will be reserved for the physically challenged people and 33% of the vacancies will be reserved for the women. The rest of the seats will be for the general people. Which important documents are required for the scheme? There are three main documents are needed for the scheme. These are Voter ID card, Aadhaar Card and Residential proof or confirmation certificate. These documents are necessary to submit while registering for the scheme. How to download the application form for Kaushalya Karnataka Scheme? To download the Kaushalya Karnataka Scheme application form one has to visit the official website of the scheme www.kaushalkar.com. In the website you will find a tab ‘Trainee Registration’. Click on the link and download the application form for the scheme. After filling up the form accordingly you can submit the form online. How to apply for the Kaushalya Karnataka Scheme? There are two ways to get registered for the scheme, one is via online and the other is via mobile app. Mobile App Registration: To register via mobile app, first download the app on your android phone from Google store. Once you download the app, follow the instruction given and proceed with the registration. Aadhaar card is mandatory in registration for the scheme. Via Online mode –Visit the official website kaushlakar.com. In the website you will get the option ‘trainee registration’. Click on the link to get the application form for the registration. Once you get the form, fill it up accordingly. The personal details like names, address, age, gender, education qualification and other details to be entered in the registration form. Once the details are entered in the form, you need to request for the One Time Password or OTP to continue with the submission process. The OTP will be sent to valid and active mobile number. Enter the OTP in the form and click on the submit button. Before clicking on the submit button, review the form properly. What is operational Last Date, official website, helpline number? The operational dates will be valid until May 27th, 2017 from the date of scheme launch. The official website of the scheme is www.kaushalkar.com. How to download TP/TC checklist for 2018? All candidates, who are interested in applying for the Skill Development Programs will have to log on to http://www.kaushalkar.com/registration?lang=kn. This is the official portal address. From here, applicants will be able to apply as well as attain information about the 2018 project retails. As soon as the webpage opens, candidates will have to click on the option that is marked as TP/TC check list. It is located at the top of the homepage. It will trigger the site to bring up the download option. If the candidate wants to get the PDF format, then he/she needs to click on the download option. To get to this PDF file directly, click on the link http://www.kaushalkar.com/images/TP_TC_Checklist.pdf.